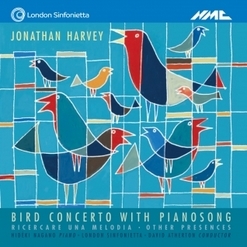 Harvey started writing Bird Concerto when he was in California and says that 'indigo bunting, orchard oriole, golden crowned sparrow ... are some of the forty colourful Californian birds whose songs and cries sparked the ignition of this work'. The bird sounds have been innovatively transformed to create a mesmeric dialogue between nature and art. Harvey sets the piano soloist the challenge of combining piano playing and triggering a sampler/synthesizer so that the live electronics can be realised in real-time performance. Ricercare una melodia (1984) was originally written for trumpet and quadraphonic tape-delay system, here performed on oboe and cello, with live electronics from Sound Intermedia.